Our Web Chat widget allows you to offer a live chat experience on your website. This additional channel makes it easy for your Agents to communicate with all of your end users, whether they visit your website or your mobile app. It just takes one line of code on your website to get you started using it today! Implementation of Web Chat requires collaboration between your web development and support teams. For this reason, we have divided the first part of guide into two parts for each team. When setting up Web Chat, we strongly recommend implementing User Identity Verification to protect the data of your users using the Web Chat widget. To learn how, see What is User Identity Verification, and how do I set it up? 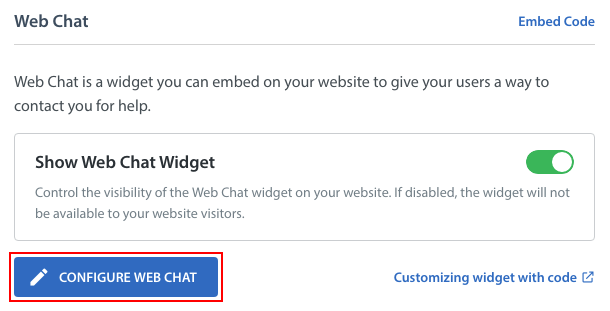 For a list of which web and mobile browsers currently supported for Web Chat, see What browsers does Helpshift officially support for the Dashboard & Web Chat? For complete steps to set up Web Chat, review each section below. For more detailed steps and best practices, please see our Knowledge Base. The Web Chat platform will now appear under the list of available platforms for this app. 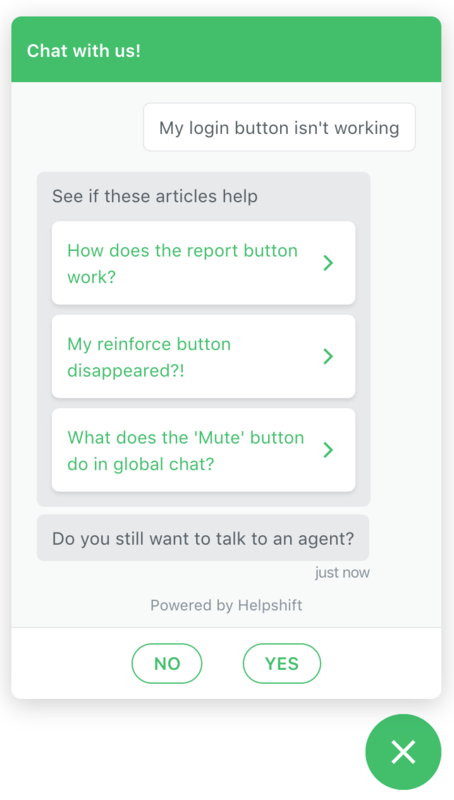 You can test the Web Chat widget by starting a chat as an end user and then replying to yourself as a Helpshift Agent. To do so, reload your webpage with the code snippet added above, then type text into the ‘Send a message’ space to initiate a chat as an end user. 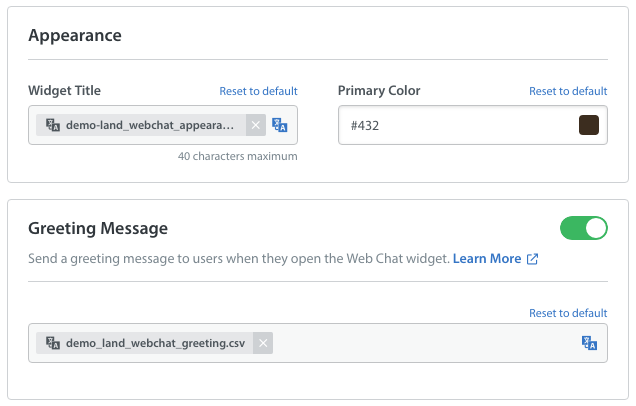 Please note: for additional UI customization, such as the ability to configure the color of chat text, the typing indicator, error messages and more, please refer your developer to our developer documentation on Web Chat design. 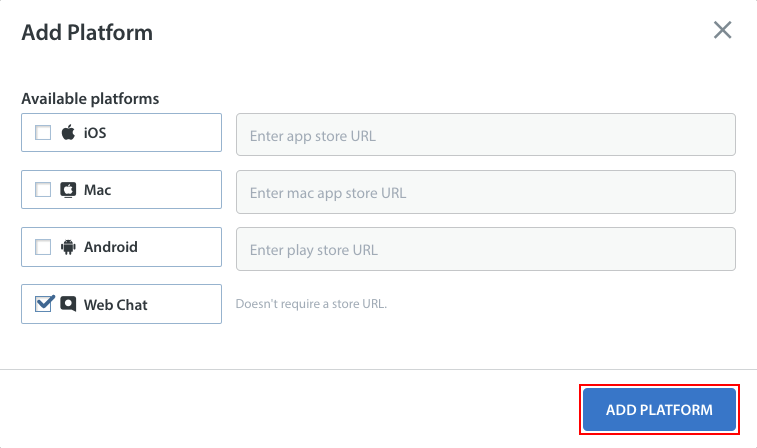 Navigate to Settings > App Settings > select the app you’d like to configure, then scroll down to the ‘Web Chat’ area. Click the ‘Configure Web Chat’ button. A pop-up will appear where you can can update all of the settings that impact your Web Chat user experience. If you have only one language enabled, you’ll see text fields where you can enter a greeting message and widget title. 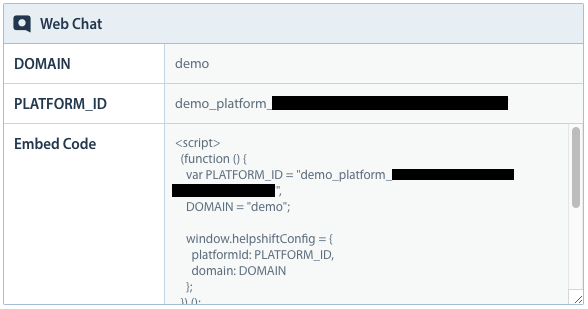 If you have your Dashboard set up to support multiple languages, you’ll see fields to upload a CSV with translations of each of your messages for Web Chat. You can also enable the Show Agent’s Nickname toggle to have your Agent’s nickname visible to the end user during the chat. (We’ll tell you how to set up business hours and Bots in the following sections of this guide – scroll down to the bottom to complete this section). At the bottom of the page, the View Previous Conversations toggle can be enabled to allow your end users to see their past conversations on Web Chat. To learn about how this works, see How do I allow my end users to see past conversations? You’ll also see the User Attachments toggle. Enabling this will allow your end users to attach files within Web Chat conversations. A preview of what the Web Chat window will look like once these changes take effect is provided on the right side of the screen. Use the ‘Preview’ toggle to review the appearance of the chat window in Web Chat with Bots and other settings enabled. 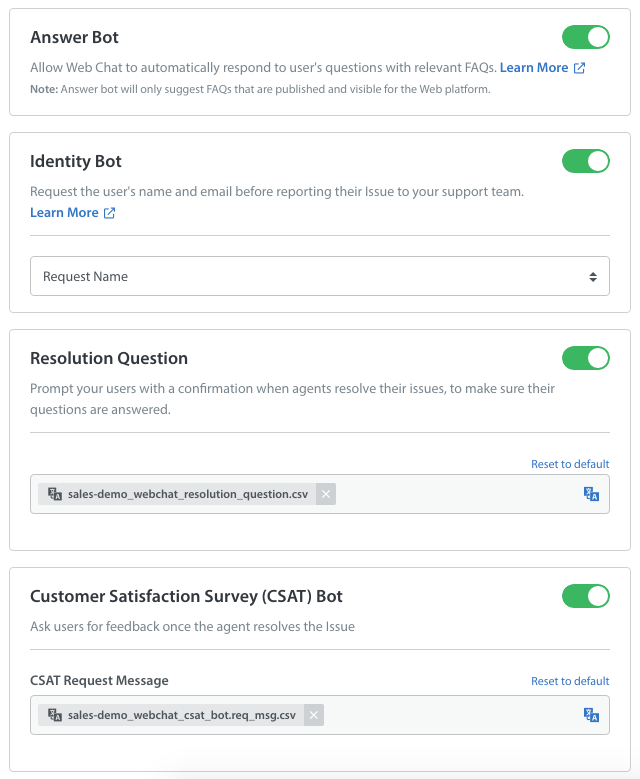 In the middle of the Web Chat configuration page, you’ll see three Bots listed: the Answer Bot, the Identity Bot, and the CSAT Bot. The Answer Bot will automatically suggest relevant, published FAQs to end users based on their messages. After suggesting the FAQs, the Bot will ask the end user if they still need Agent assistance. The end user can click ‘Yes’ to reach out to your support team. 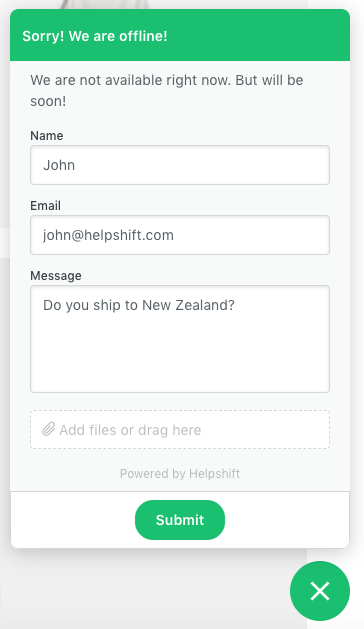 Only after they have clicked ‘Yes’ to this prompt will a new Issue be created in your Helpshift Dashboard. The exception to this is if you also have the Identity Bot enabled, as detailed below. The Answer Bot can be unlocked with an account upgrade. Please reach out to success@helpshift.com to learn more. If you already have Answer Bot and want more details on how it works, see What is the Answer Bot, and how do I set it up? 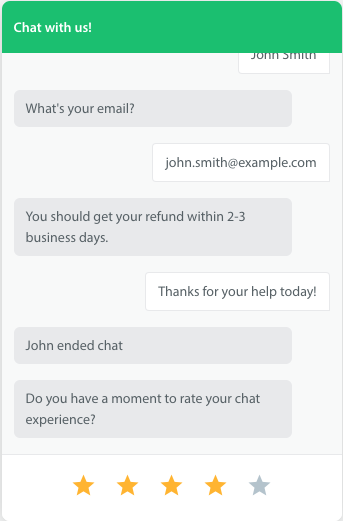 The Identity Bot will prompt your end users to provide their name and/or email after they have replied ‘Yes’ to the Answer Bot prompt. This will appear as part of the normal flow of the chat. Note: in the screenshot above, a New Issue Automation has been used to send the ‘An agent will be with you shortly’ message. We recommend setting this up to manage expectations for end users about when an Agent will be with them. To learn how, see What are New Issue Automations, and how do I set them up? 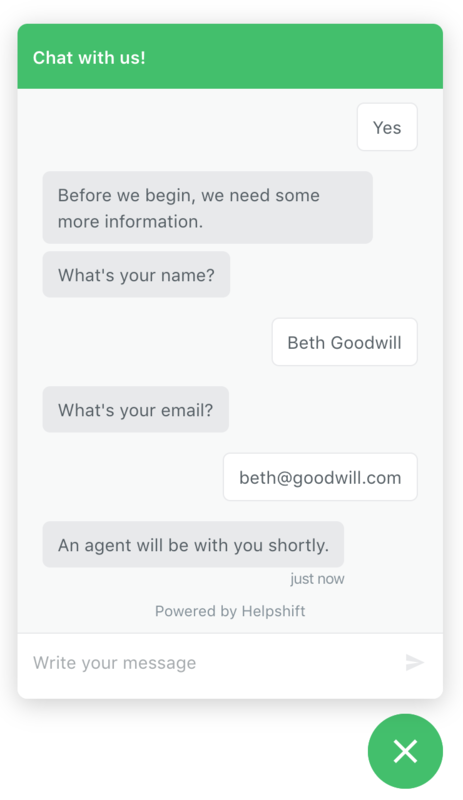 If you have both the Identity Bot and the Answer Bot enabled, the new Issue will only be created in the Helpshift Dashboard after the end user has provided their name and or/email address. For complete details on how Identity Bot works and how to enable it, see What is the Identity Bot, and how does it work? Once they have completed feedback, it will appear in the Issue per your CSAT Permission settings. 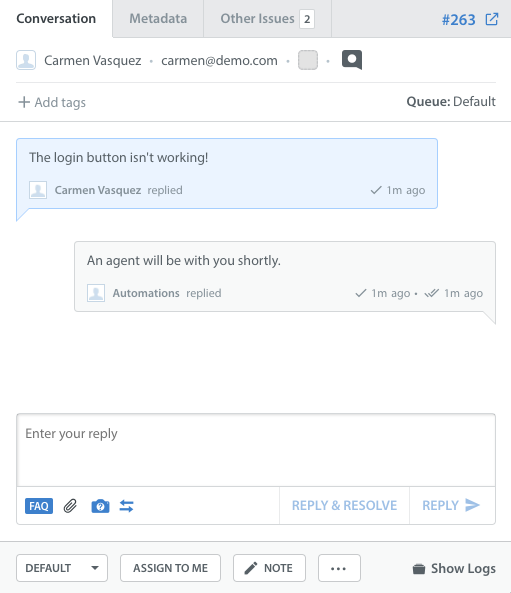 Custom Bots allow you to conduct end-to-end Issue management for common Issue types to save your Agents the work of having to respond to common question types over and over. 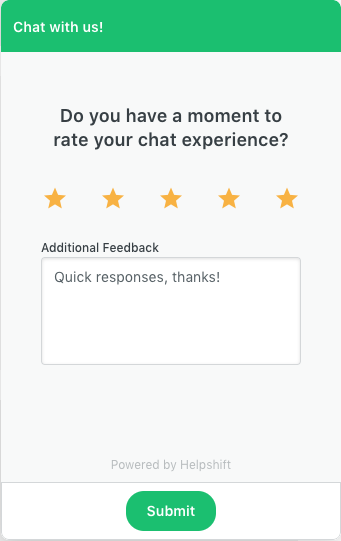 They can be used with Web Chat to prompt users to provide an update, request additional information based on the type of inquiry, set expectations about when they should expect to hear back from your support team, and more. To get started with Custom Bots, see What are Custom Bots, and how do I set them up? You can set up business hours for Web Chat to set expectations with end users by letting them know when your team will be available to help them. On the Web Chat configuration page, you’ll see a section for Business Hours. Use the drop-downs in the ‘Hours’ sections to configure the dates and times when the business hours message should display. 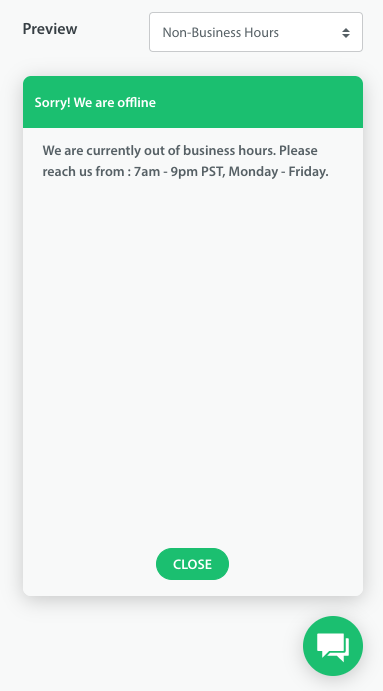 In the Non-Business hours behavior section, you can select whether or not you’d like to allow your end users to leave a message, or hide your Web Chat widget entirely when your team is not available to respond. Provide a Contact Form Message to encourage users to reach out in the event that your team is unavailable. Add Contact Form Fields they can complete to enable your team to follow up and continue communication. Enable attachments so they can attach a file as needed. Automatically tag these incoming Issues so they will be automatically routed to the appropriate Queues or filtered into Smart Views. You can also set the message that displays to users during non-business hours by filling out the ‘Widget Title (Non Business Hours)’ text field. You can preview how your business hours will look on the right side by selecting the ‘Non-Business Hours’ option in the Preview drop-down. You can track Issues that come in during non-business hours by setting up a Custom Issue Field or tag for Issues that meet this criteria. 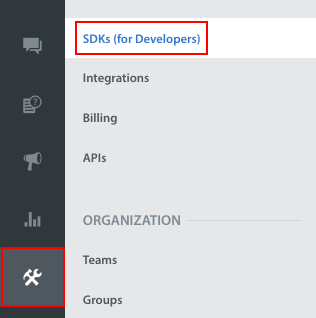 You can then track that tag data in Helpshift Analytics or the Custom Issue Field or tag data in Power BI. You can distinguish Issues created via Web Chat from other Issues by looking for the web chat icon on the Conversation page. You can also check the ‘Metadata’ tab. Web Chat is best used as a live chat experience, as this is what your end users will expect when they start a chat. To set up additional tools for providing a live chat experience to end users, please see our Live Chat Experience guide. Additional resources for optimizing your workflow to support a live chat experience can be found in our Workflow Management guide.